A white paper by Dr. Ming-Hsiang Tsou and Jennifer Smith, Free and Open Source Software for GIS Education, describes various open source software for GIS educators. A journal article, Enhancing General Education with Geographic Information Science and Spatial Literacy, was published by Dr. Ming-Hsiang Tsou and Ken Yanow. The NVC conducts an onsite annual review of project-related activities and advises the project investigators. 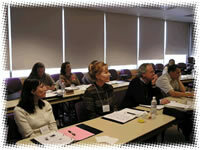 The NVC Committee met with program-related faculty and staff of San Diego Mesa College, San Diego State University, and three San Diego area high schools on April 16, 2007. Attending from the NVC were: Ms. Ann Johnson, Chair, Dr. Karen Kemp, Dr. Arthur Getis, Dr. Joseph Kerski, and Mr. Warren Roberts. After concluding the meeting and review, the NVC compiles a report of their observations and recommendations. This document consists of the annual report on project participants, collaborators, activities, and findings between October 2006 and October 2007. This report was submitted to the NSF on May 1, 2007. The NVC Committee met with program-related faculty and staff of San Diego Mesa College, San Diego State University, and three San Diego area high schools on the evening of March 29 and all day March 30, 2006. Attending from the NVC were: Ms. Ann Johnson, Chair, Dr. Karen Kemp, Dr. Arthur Getis, and Mr. Warren Roberts. In communication by phone was Dr. Joseph Kerski. After concluding the meeting and review, the NVC compiles a report of their observations and recommendations. This document consists of the annual report on project participants, collaborators, activities, and findings between October 2005 and October 2006. This report was submitted to the NSF on April 11, 2006. The National Research Council (NRC) and other government entities have recognized GIS, and its requisite spatial skill set as one of the fastest growing segments of technology. (National Research Council, 2005) Additionally, the NRC and other leading advisory bodies anticipate a severe labor shortfall of skilled workers with working knowledge of GIS and general spatial principles. (Sietzen, June 2004) In anticipation of this, and to maintain a leading role for American workers in the 21st Century global workplace, the NRC has recently issued strong recommendations for mandated spatial knowledge and skills education in K-12 schools. (National Research Council, 2005) No doubt, this will have a profound impact on our educational system at the local, regional, and national levels. Secondary school graduates, whose appetite will be whetted by their mandated training/instruction in, and increasing exposure to, GIS and related technologies; in addition to growing industry demands, present a great challenge and opportunity for educators and administrators in post-secondary educational programs. This document, along with the efforts of the NSF-ATE researchers(NSF-ATE DUE #0401990, 2005), are directed towards addressing these critical needs. This document consists of the annual report on project participants, collaborators, activities, and findings between October 2004 and October 2005. This report was submitted to the NSF on April 1, 2005. 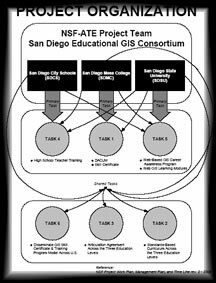 In the summer of 2005, San Diego City Schools held a summer teacher institute in order to present problem-based learning activities to San Diego City Schools high school teachers. We were invited to present GIS as a possible problem-based learning tool since most data and analysis have some kind of spatial/location component. At the conclusion of each of our presentations, we administered a survey to the teachers in order to determine the frontline teachers' needs. The results of the survey indicated a great interest in geospatial technologies to support education. A detailed analysis of the Web traffic, links, sources of Web traffic, keyword searches, etc. is available in a single document or as an indexed hypertext page. The analysis covers Web server traffic from March 15, 2005 to March 15, 2006. FULL NSF-ATE TEAM MEETING MINUTES. Bi-Monthly assessment, evaluation, report, and steering meeting of the NSF-ATE Project. Bi-Weekly assessment, evaluation, report, and steering meeting of the NSF-ATE Project. Weekly assessment, evaluation, report, and steering meeting of the NSF-ATE Project. A graphical chart was developed in order to represent the project management, responsibilities, and responsible parties. On March 24 & 25 of 2005, the National Visiting Committee, which advises and follows our project on behalf of the NSF, visited our research facilities in San Diego, California to hear our first year status report and offer their collective comments, support, and advise on our project results and direction.